Looking for a book to help you with your writing? Get some ideas here. This is one of a series of books by Mary Buckham. 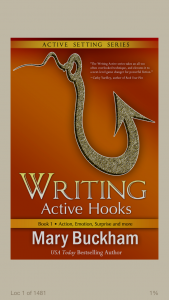 She has books on writing active hooks, and writing active settings, and I think I’ll be working my way through them. 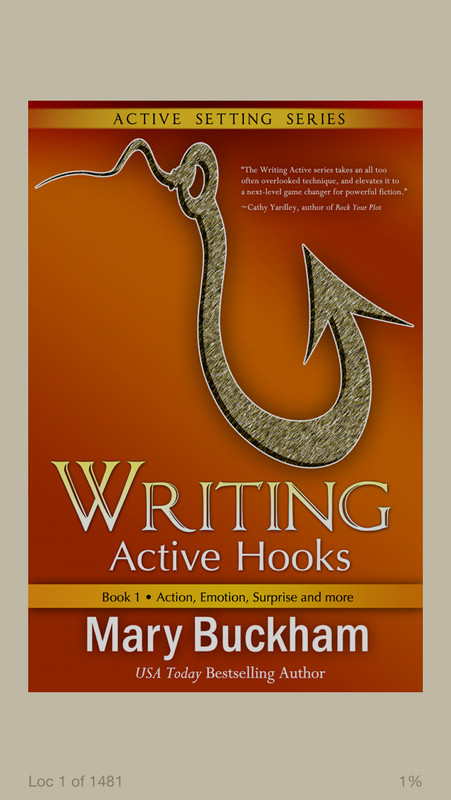 This one is on Active Hooks, covering action, emotion, surprise and raising questions, with mentions of other types of hooks (book 2 in the series includes unique character hooks and foreshadowing among its topics, as well as placement of hooks). This book is only available as kindle version, costing around the same as a posh coffee, although I note that there is an omnibus edition available of the Active Settings series, with the Active Hooks as a bonus, in both ebook and paperback format, and I’m very tempted. Hooks are “tools to engage readers and keep them engaged”, and the examples include ideas on how to control the tension within the hook, depending on what genre you’re writing in. Each hook is introduced clearly, with each chapter including examples from popular fiction, plus worked examples where a simple sentence is enhanced to include a hook, or a variety of hooks, that pull the reader forward and make them want to read more. There are then practical assignments, such as going into a book shop, to a shelf you don’t normally read from, and picking up books at random to read their opening sentence. This isn’t a particularly long book, but it provides a lot of detail on a specific topic, and is worth a look at if you feel your writing needs a little more jazz. As it’s a short ebook, it’s ideal to have on your phone app for those moments you’re out and about and need something to read. By itself, it’s not going to have a major effect on your writing, but if you’re at the stage where you’re confident on the basics of plot and setting and just want that extra oomph that will pull the readers along, then this would be well worth considering. This entry was posted in Writing book reviews and tagged editing, resources, writing on September 2, 2015 by Lin White. I have a large and growing collection of writing-related and editing-related books, and i thought it might be useful to review a few of them. 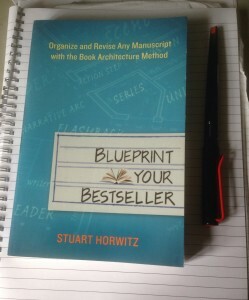 The first book I’m looking at is Blueprint Your Bestseller, by Stuart Horwitz. This book is aimed at considering the overall structure of your book. It applies to both fiction and nonfiction – this book itself was written using the same methodology – and does not touch on topics such as point of view, dialogue or showing and telling. Instead, it shows how to break down your work into series, scenes and an overall theme. By considering how these series develop, and the scenes in which series converge, you can reach a deeper understanding of what your book is about, and how to improve it. This book is best used once you have a rough draft – action step zero is to write around a hundred pages, so it’s ideal for helping you to make sense of your nano novel, for example. It then gives you 22 steps towards improving the structure and strengthening your content. These steps are practical and straightforward, when read in conjunction with the main text, and provide a clear way to produce a multi-threaded story, where the threads (or series) back each other up and support each other. For example, one step is to draw a target representing the theme that you’ve worked out, and to consider how close each scene is to that target. Like many “structure” books, a worked example is given, but unlike some that rely on you having at least basic knowledge of the story under analysis, this one works with a commonly known fairy tale, The Ugly Duckling, and includes the full text of the tale, in both simple and annotated versions. This is rapidly becoming a favourite of mine, and the techniques included are proving very useful when I carry out developmental editing. This entry was posted in Writing book reviews and tagged editing, resources, writing on August 27, 2015 by Lin White.